The study aims to clarify the relationship between well-being at work and motivation to undertake additional learning activities. It was conducted among 96 professionally active individuals, students of Bachelor’s and supplementary Master’s degree studies with majors in Economics and Management as well as Master’s degree students having an Individual Course of Studies majoring in Psychology. The hypotheses have been verified using: the Well-being in the Workplace Questionnaire by Czerw (2017), the Job Satisfaction questionnaire by Bajcar et al. (2011) and an original questionnaire of activity and motivation in the field of learning. 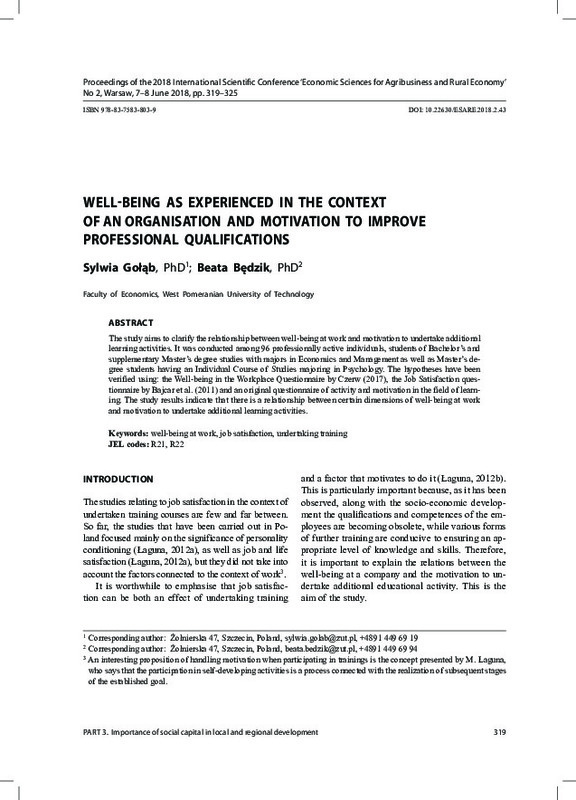 The study results indicate that there is a relationship between certain dimensions of well-being at work and motivation to undertake additional learning activities.